Peer coaching “refers to a specific form of coaching carried out among colleagues. The members of the group take turns in adopting the role of coach and thus provide coaching to each other. All members are responsible for the coaching process. Synonyms are: ‘Intervision’, ‘Collegial Coaching’” (Ajdukovic et. al 2015, p. 37). Peer coaching comes from Supervision, where an expert works with one person or a group on their cases at work. It is often used for reflection of counsellors, coaches, and educators. The group that does peer coaching is of equal rank. That does not mean, that persons in the group can be differently qualified, but it means, that everyone in the group may bring in his problem equally and no one of the group is a professional coach who leads the group or process. Another thing is the professional focus. Usually there is a common professional interest. People in the group have a common objective, because they have maybe the same professional background. The process is target-oriented which means it is about a solution-focused exchange to find one or more solutions that can be transferred into work afterwards. There is a mutually defined structure that supports the peer coaching process. 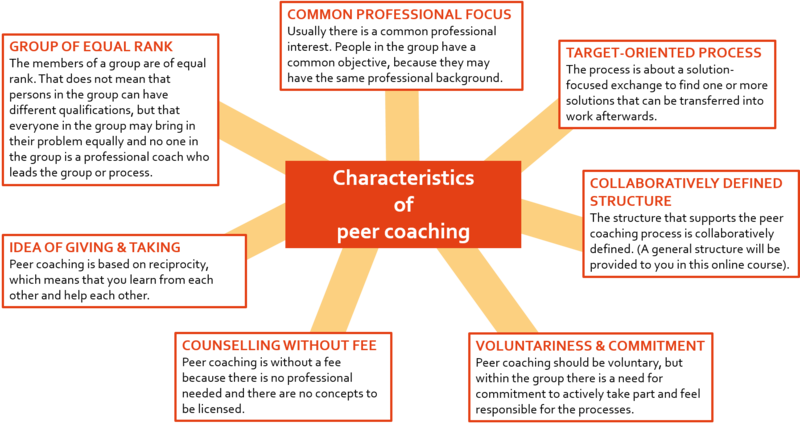 Peer coaching should be voluntary, but within the group there is a need of liability to take part actively and feel responsible for the processes. There is the idea of “giving and taking” which means that you learn from each other and help each other. To perform peer coaching there is the need of the group members to take in different roles. In this peer coaching model there are three roles: client, peer coaching facilitator and advisors. In each coaching process there is only one client and one peer coaching facilitator but many advisors (the rest of the peer coaching group members). There should be at least three advisors in order to have a helpful process. The EmployID peer coaching process is based on Lippmann (2009), Berg & Berninger-Schaefer (2010), Berninger-Schaefer (2011). The contact person of the group welcomes everybody, problems of group members are collected and selection. Afterwards roles for the peer coaching session(s) need to be assigned (client, peer coaching facilitator, advisors). The peer coaching facilitator asks the client about the problem. The advisors listen actively and observe. The peer coaching facilitator asks of the last time the client was enthusiastic about something and helps the client to visualize the feelings, thoughts, strengths and resources of that moment. The advisors add their ideas on which strengths and resources that are still needed or which strengths they feel the client has hidden beyond. They can also ask, if there are e.g. supporting systems like family, friends, other persons, rituals, places with a certain atmosphere, etc. The peer coaching facilitator asks the client what the client wants to achieve in this session and the client formulates a specific goal and an order to the group, to find possible solutions for achieving the goal. The possible solutions given by the advisors are being collected. The client prioritizes and plans steps after the collection of solutions. Everybody of the group starting with client and peer coaching facilitator explain what they learned for themselves in the process. Afterwards the session is closed and another session can be started. In unit four of this week you can practice this process by yourself! For more information on peer coaching and EmployID peer coaching concept check out the EmployID Academy open online-course on peer coaching! Berg, Thomas E. & Berninger-Schaefer, Elke (2010). Die Kollegiale Coaching Konferenz. Stuttgart: Boorberg Verlag. Berninger-Schaefer, Elke (2011). Orientierung im Coaching. Stuttgart: Boorberg Verlag.